We’re excited to introduce Isotec’s Synergy Tablet as our flagship operator console. Synergy’s Wireless or Ethernet versions are the new standards for Safety Entrances® and Access Control Entrances. The tablet can be sleek or rugged; with greater functionality and performance than our esteemed 3 in 1 Synergy Console. 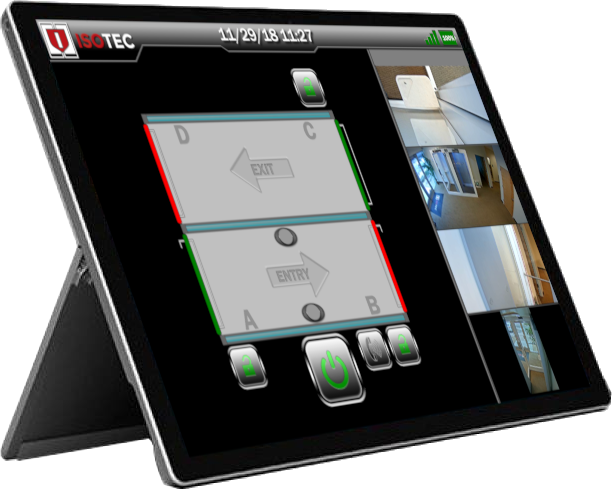 The Synergy Tablet is another industry first for Isotec; with a multitude of IP features and benefits that include WiFi or Ethernet wired utility, greater intuitive functionality, rich 1080P user interface, video viewing, intercom communication, and wireless mobility packed into one platform. All this and it also reduces installation and operating costs. No More Routing Interconnect Cables! For more information or to learn how Isotec Security Inc. can help you protect your facility, call us today at (303) 974-7699 or contact our Sales Director Matt at msamels@isotecinc.com. This entry was posted in ANSI & ADAAG Products, Banks & Credit Unions, Commercial Facilities, Isotec Security, Safety Entrance and tagged automated security, Safety Entrances, tablet, Weapons Detection. Bookmark the permalink.